Jenna Von Oy, star of “Blossom”, will be signing the copies of “Situation Momedy” at the following location. Best known for her roles as Six on Blossom and Stevie on The Parkers, Jenna von Oy is also a musician who has released two albums. She has been blogging for People.com for nearly three years and maintains her own blog, The Cradle Chronicles (cradlechonicles.com). She married husband Brad Bratcher in 2010 and gave birth to their first daughter, Gray Audrey, in 2012. Their second daughter, Marlowe Monroe, arrived in November of 2014. She resides in Nashville with her family and five dogs. 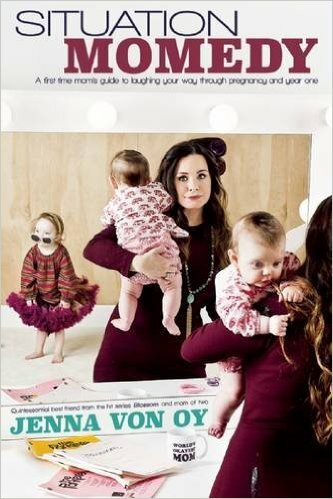 While preparing to give birth to her first daughter, actress Jenna von Oy, well-known for her roles as Six on Blossom and Stevie on The Parkers, discovered that the market was filled with clinical guides to pregnancy and beyond. Though they had their merits, she craved a best friend’s guide . . . one that didn’t sugarcoat reality but still offered relatable and heartfelt reassurance. Thus, Situation Momedy: A First-Time Mom’s Guide to Laughing Your Way through Pregnancy & Year One was born.